Everything Is Art: Painting of the Day: "Olivia"
Painting of the Day: "Olivia"
It was her expression that captured my attention. 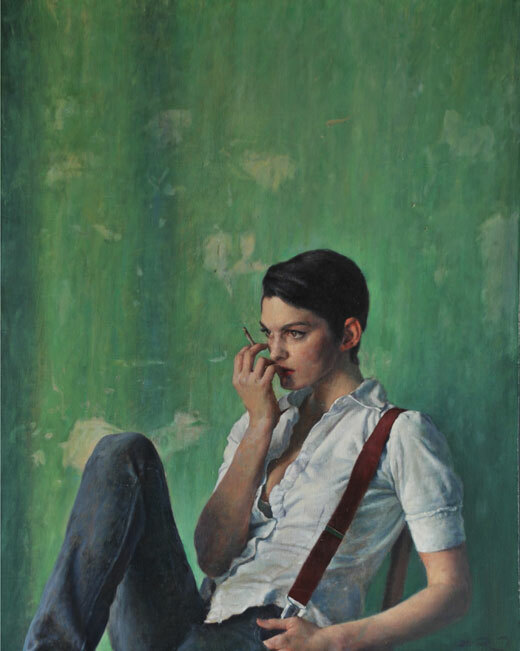 Her body language– the cigarette in her right hand, her other hand in her pocket, that whole look of aloofness mixed with contemplativeness in her eyes. Her untucked shirt with the first few buttons left unbuttoned mirroring her relaxed posture. The beautiful emerald green of the background contrasting against the red of her lips, the flush of her cheek and ear, and the darker coloured strap. The composition is very interesting as well. I recall reading a composition rule book telling against cutting humans off at their joints. The hand of the model and her feet are just out of the frame, and yet the painting still works perfectly. It's a brilliant painting– harmonious, innovative, and beautifully composed all in one. To see more of his works, click here. Painting of the Day: "Deafening Silence"
Painting of the Day: "Panacea"
Painting of the Day: "III P R I N T E M P S"